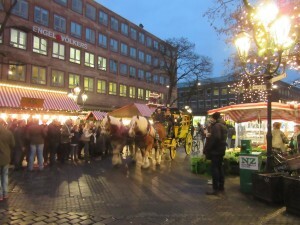 The Christkindlmarkts or outdoor Christmas Markets are unique to Western Europe and especially loved here in Germany. From tiny one day events in the villages to gigantic month long affairs in the big cities that start the last week in November and don’t shutoff the lights until Christmas Eve, every where you go there’s a market. They are such joyous events! 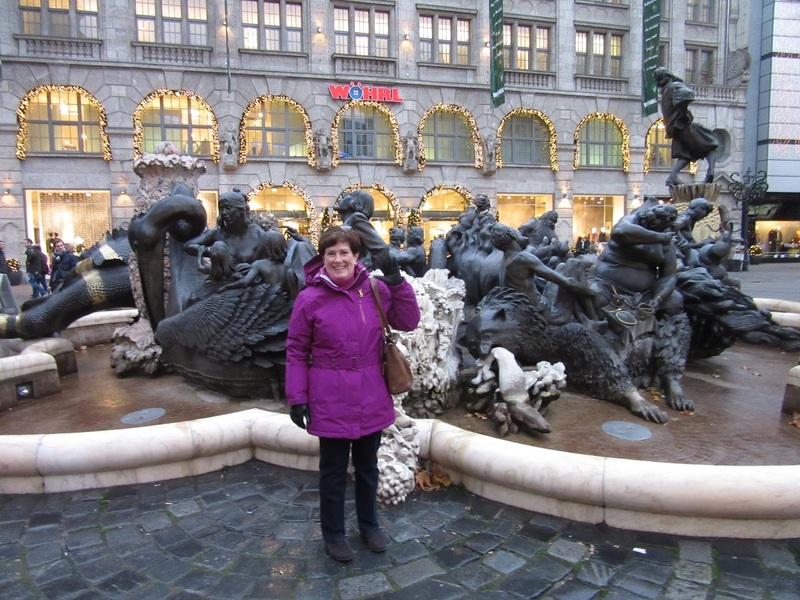 Mobs of happy, excited shoppers out strolling the streets in all kinds of winter weather. Meeting up with their friends. 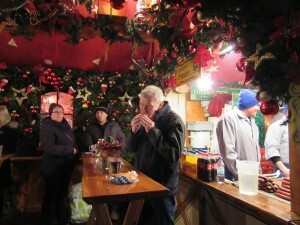 Maybe having a Gluhwein or 2 along with a Brotwurst Semmel mit senf. 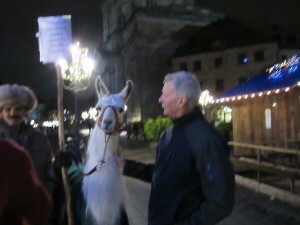 Dan and I have visited quite a few, both big and small and found they each have their own special charm. And such a variety of goods they sell! I could go on and on, but let me show you what we experienced at the mother of all Christkindlmarkts, The Nurnberg Christmas Market! Nurnberg or “Nuremberg” as Americans know it, is a city with a bit over 500,000 people, making it the 4th largest city in Germany. 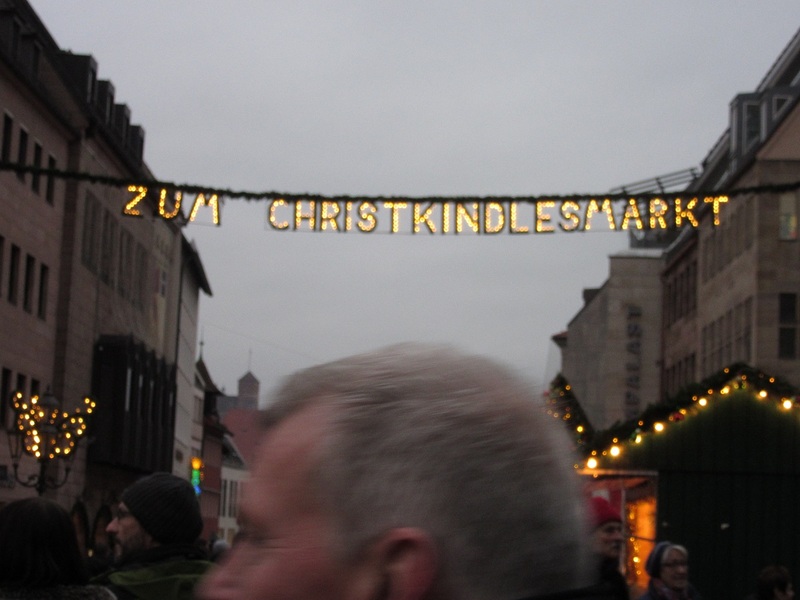 It’s 110 miles north of Munich, so it took us maybe 2 -1/2 hours to drive there. 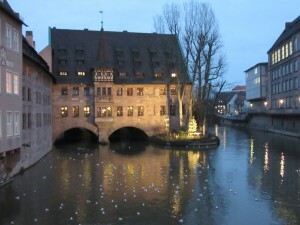 It’s an ancient “walled” city with Ramparts and Guard houses at each of the 4 corners. Outside the walls is where industry occurs, but inside is the city center with the enormous shopping district, commerce, Churches and government. Many streets are closed to cars and hoofing it is the way of the land! And my hooves sure got a workout the 3 days we visited. 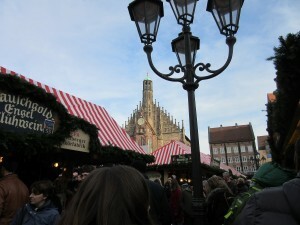 Nurnberg has the biggest and best Christmas Market in all of Germany. 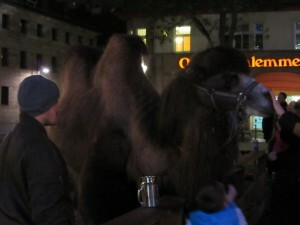 We were pretty amazed at the size and scope of it all. 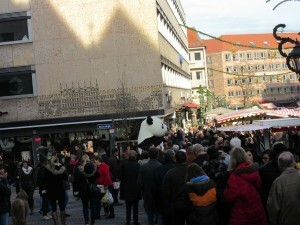 Tourists from around the world gather here for the market. It is centered at the town square, a huge open area in the heart of the city and then branches out into the side streets and neighborhoods. 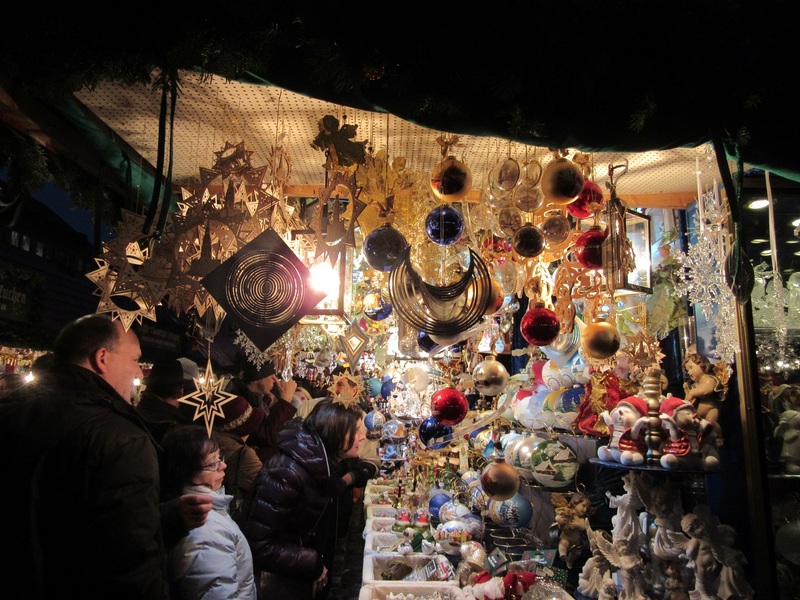 Even the ever popular river boat cruise ships deliver boatloads of visitors to this market. Street food, German style plays an important role in the markets and there are tons of vendors! It’s all stand up, walk around and eat kind of foods. No chairs, or benches anywhere so don’t plan on resting your legs ’cause it just ain’t gonna happen. Crepes, Falafel, Doner ( think Souvlaki), roasted nuts, chocolate covered everything, but the most numerous vendors are the ( take a guess?) SAUSAGE STANDS! Yea! 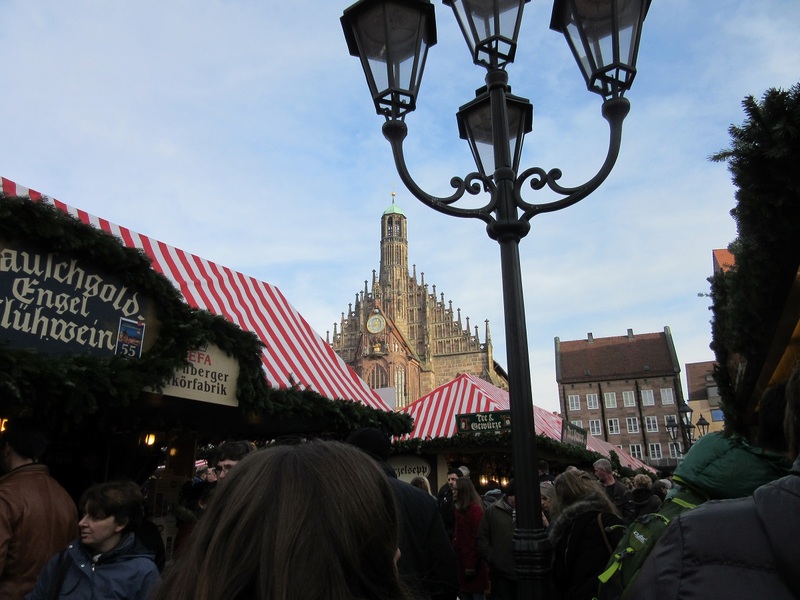 Nurnberg roasties are the sausage to buy here. You get 3 finger sized Brotwurst on a hard roll for about 3€ or $3. Large brots are another favorite, either fresh or smoked, again, served on a hard roll with mustard or as the Germans say, “Sausage Semmel mit senf.” Thin sliced marinated pork, served with fried onions and curryketchup on a roll is a real crowd pleaser too. 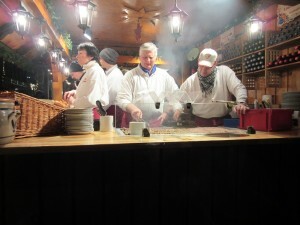 One of the many sausage stands. Dan enjoying his sausage semmel mit senf! The sausage stands are all decked out for Christmas. 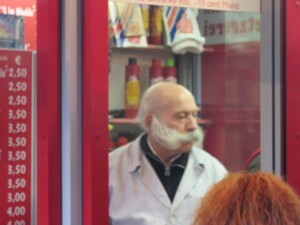 Mr. Moustaches at another sausage stand! Love this guy! 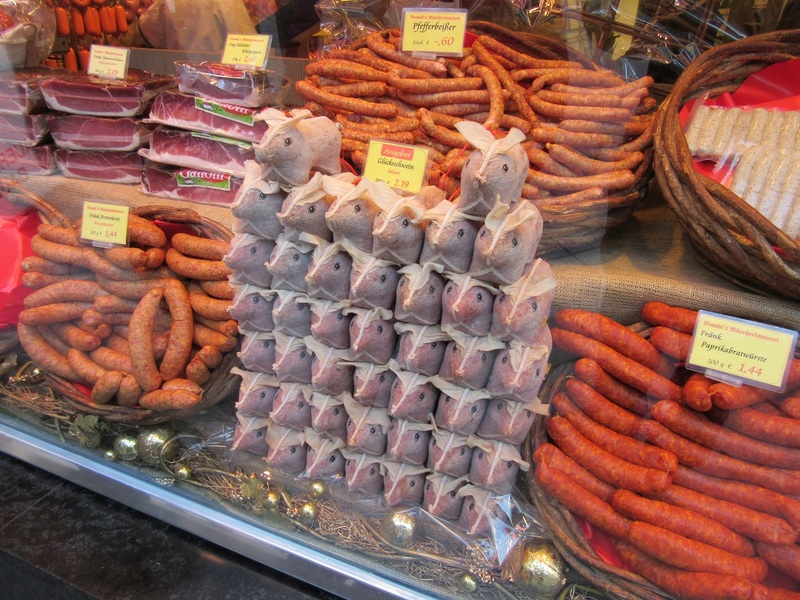 Sausage meat shops also abound in Nurnberg and though technically not part of the Christmas Market, I couldn’t help sharing the next 2 photos. See if you like them. 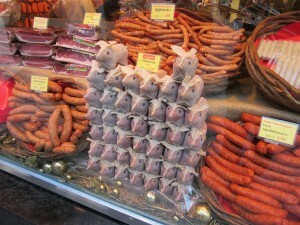 These are sausages placed into piggy shaped wrappers! I’ve never seen those before. 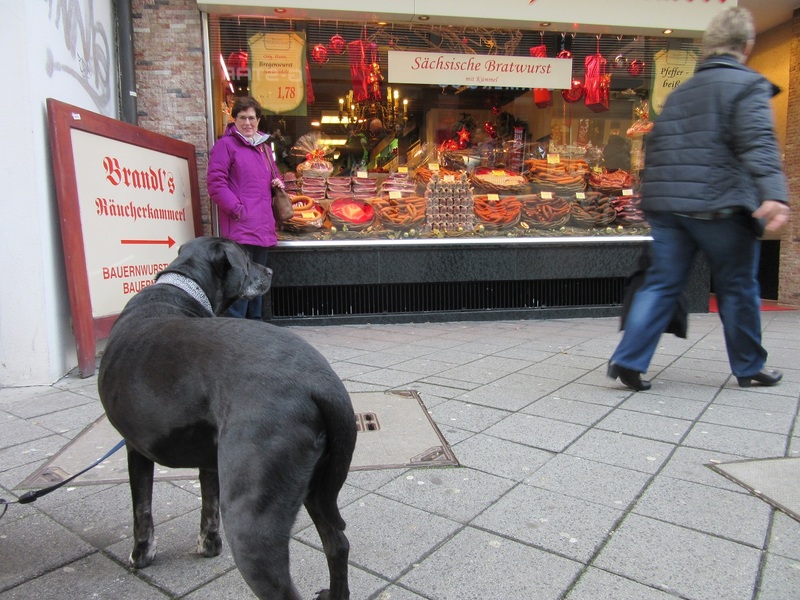 And LOOK at all the sausages in the window. 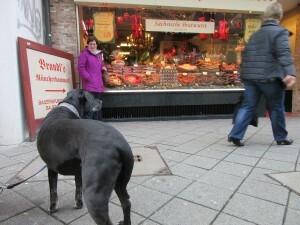 Look who else is intrigued and drooling over the sausages! This handsome guy’s owner was inside the shop and he never stopped starring at the window! The Christkindlemarkt Angel is an important symbol and you find her everywhere. 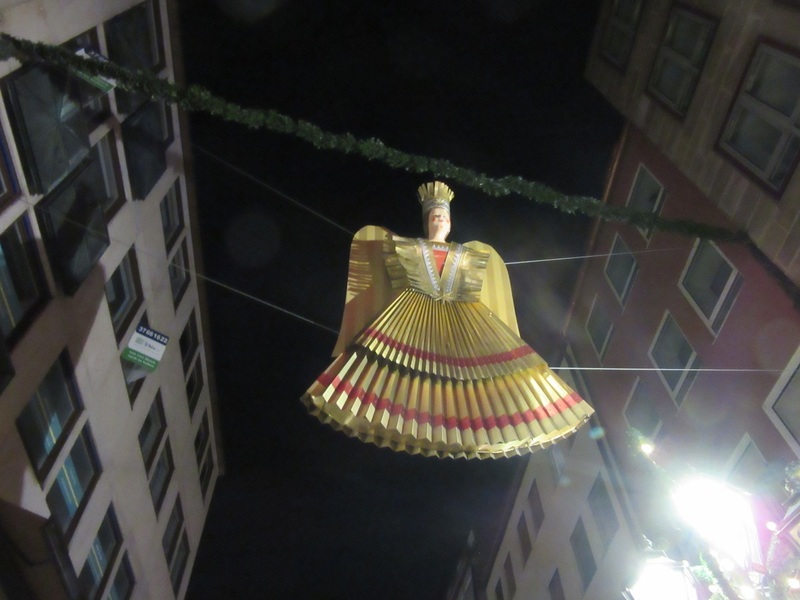 In Nurnberg, they crown a young woman as the Market Angel and her role is to open the Market each year and make public appearances during the year. She reigns for 2 years. We walked all day and all evening for 3 days just taking in as much as we could find. Kids of all ages loved Mr. Panda! 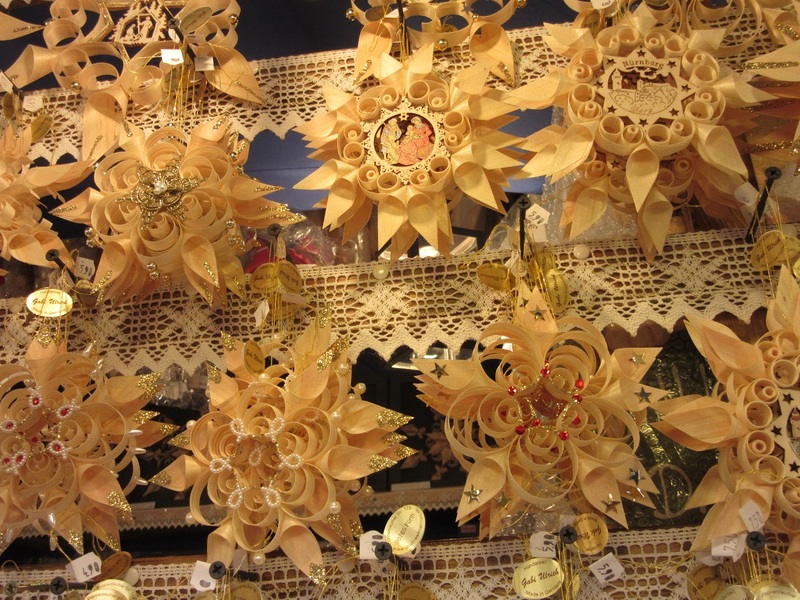 Like Cinderella, you could ride in a golden yellow Stage Coach! 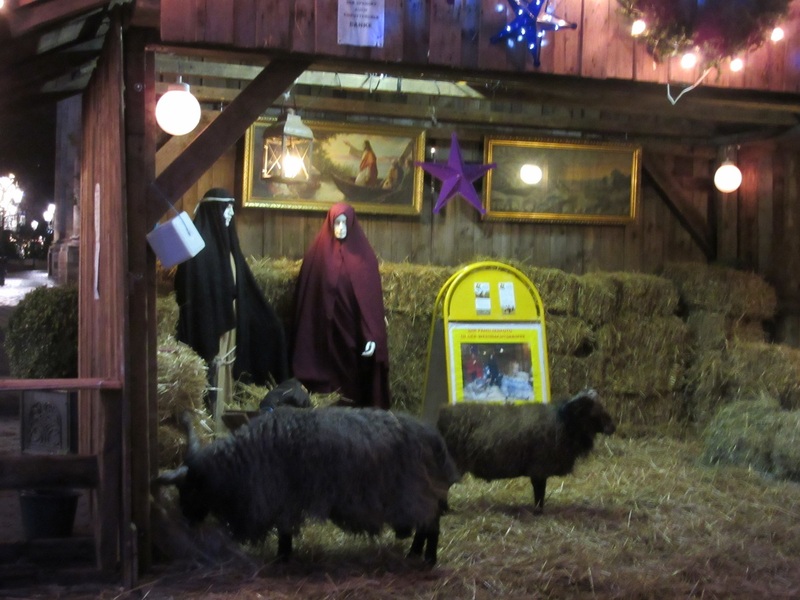 Away from the throngs of people but still in the tick of things was a living Manger scene. 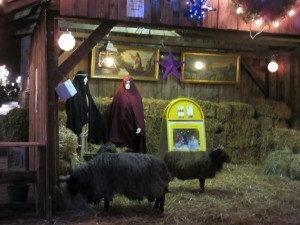 The Holy Family were mannequins but the animals were real. 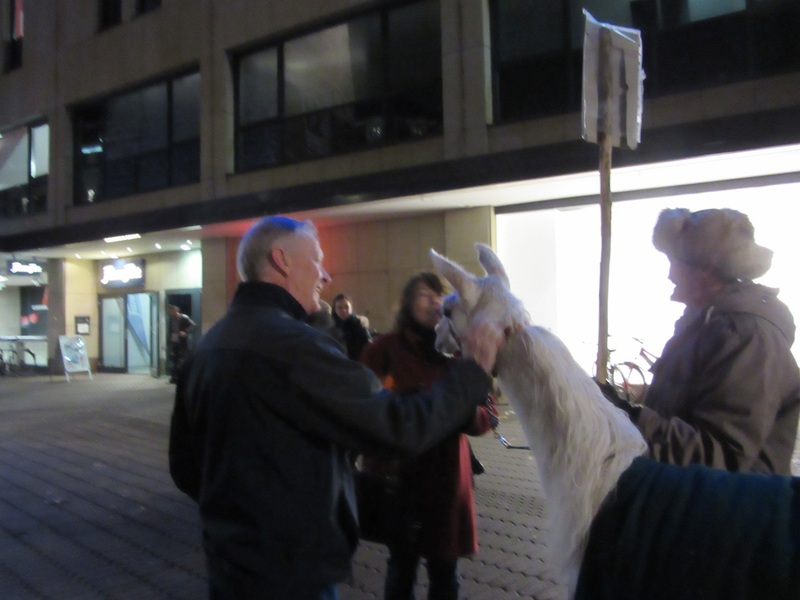 A very well behaved Llama. 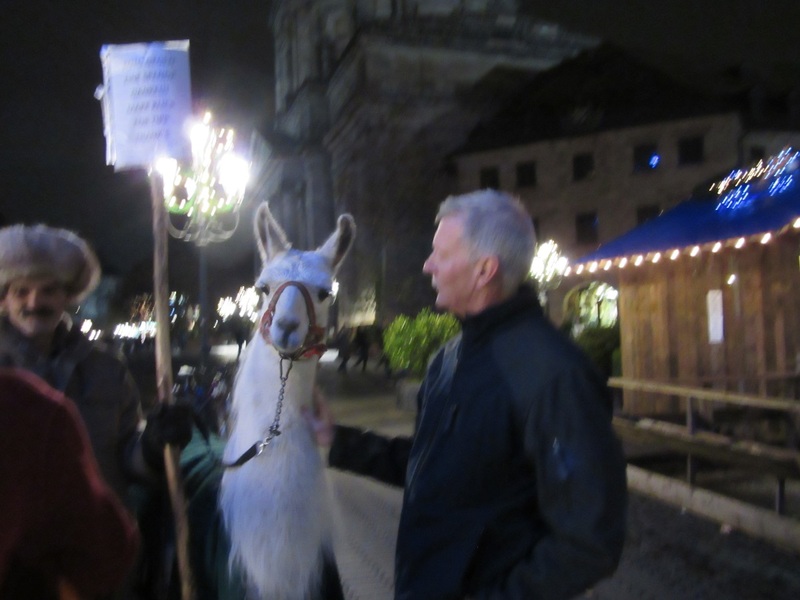 We felt bad for the Llama who was obviously well cared for but Dan still wanted to take him back to the Hotel! One BIG fluffy Camel. He was gorgeous! 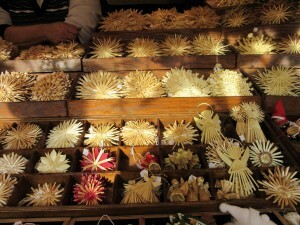 The Vendors all had their own specialty items for sale. Ceramic houses that had smoke coming from the chimneys. Hand made candles. 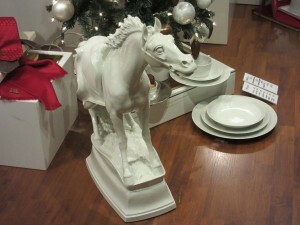 Nativity sets. Schnapps of all flavors. Leather wallets and bags. And much, much more. Handmade ornaments of Straw were delicate and intricate. 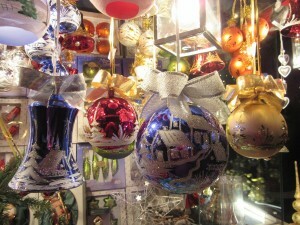 Hand painted glass ornaments were beautiful! 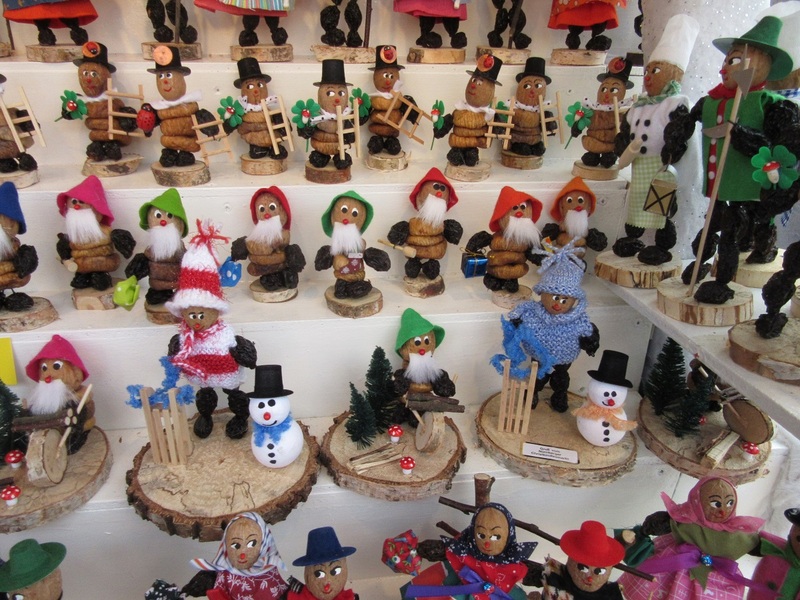 These adorable figurines are made from dried figs. 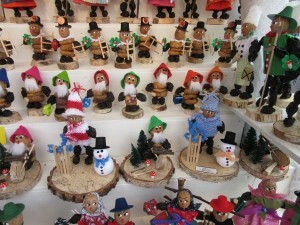 One of these shaved wood ornaments came home with me. So fragile appearing! 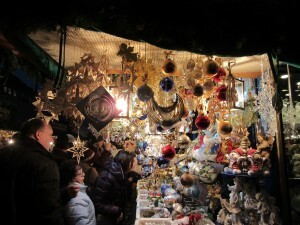 Christmas decorations of all types were abundant! 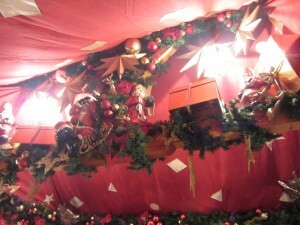 But, it wasn’t all decorations. 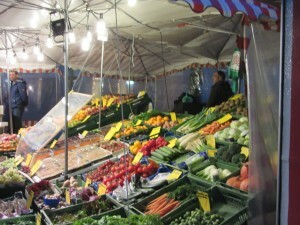 There were fruit and vegetable stands. 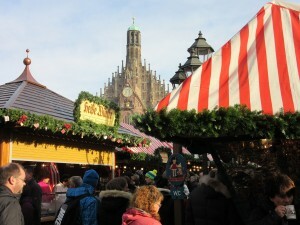 Vendors selling handmade soaps or Gluhwein, which is a hot, spiced, sweet wine. Wonderful fruit and vegetable produce! I can vouch for the grapes. 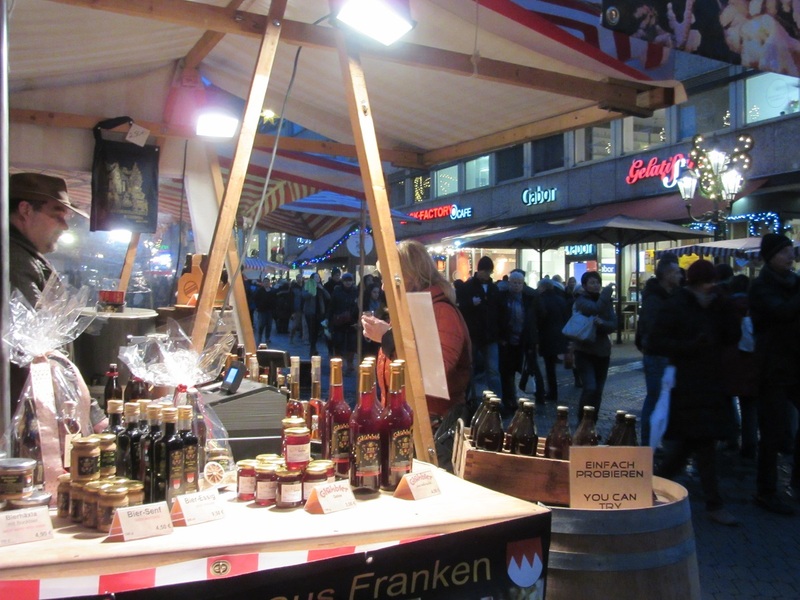 Homemade flavored Mustard ( senf),Marmalades, Fruit Syrups and bottles of wine. 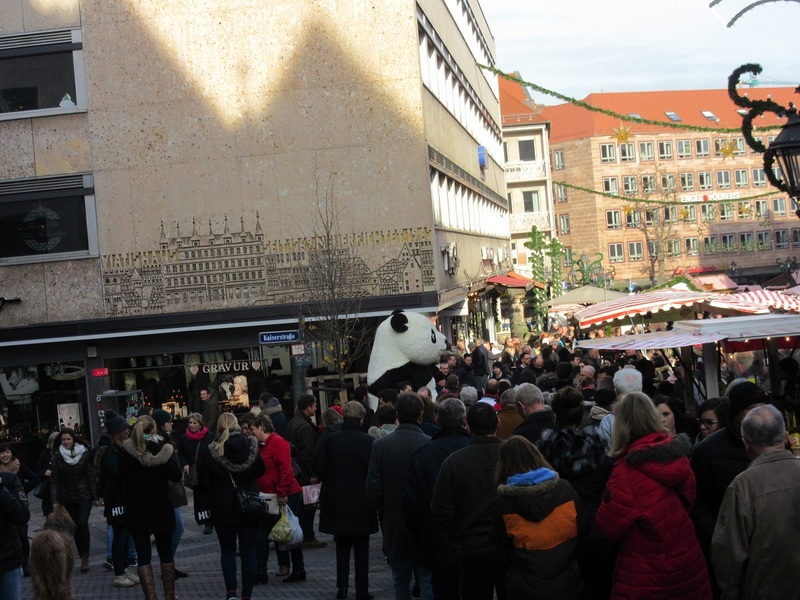 The crowds were so thick in the afternoon it was hard for a vertically challenged person to see! So, I just kept looking up at the jaw dropping churches! 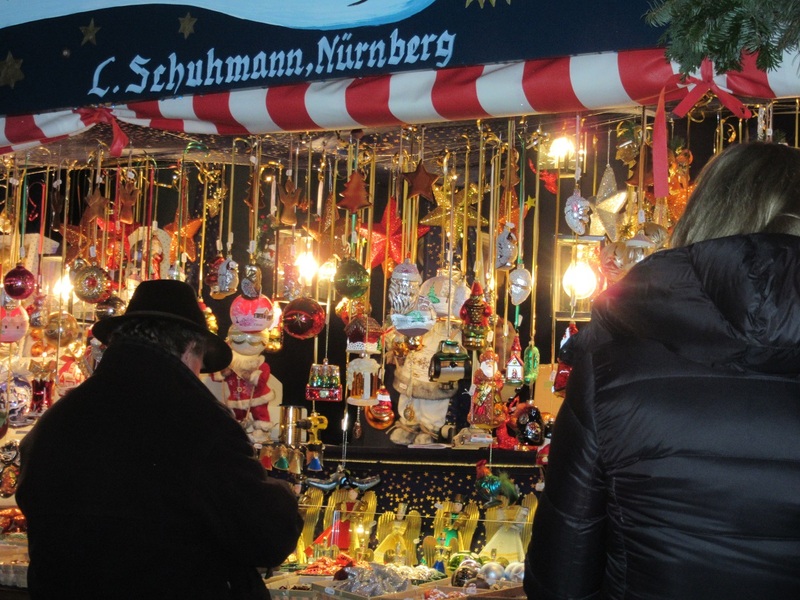 Nurnberg’s Christkindlmarkt is something not to be missed if you should travel to Germany, but Nurnberg is more, so much more than its Christmas Market. A beautiful ancient city with both an inspiring past and a horrific past. A city well worth exploring with each season offering its own flavor. 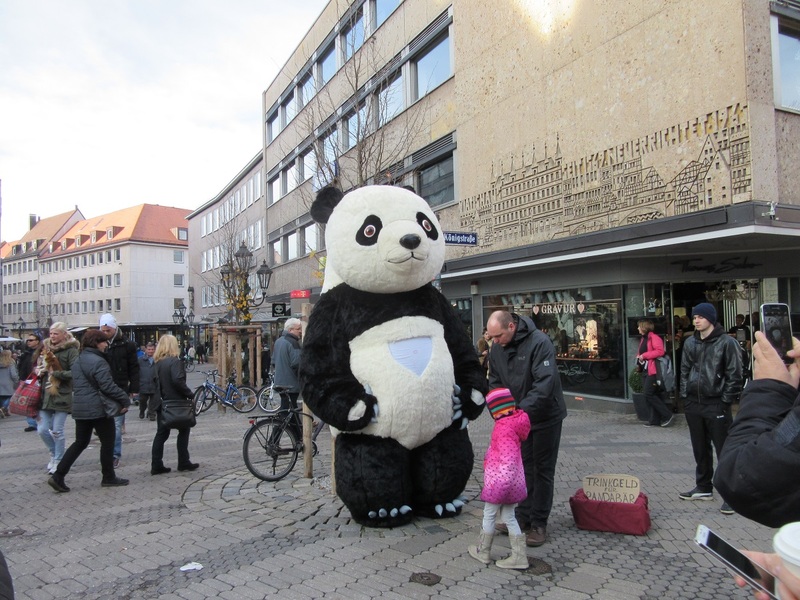 I’ll leave you with a hint of the rest of Nurnberg. Loverly restaurant right on the river! 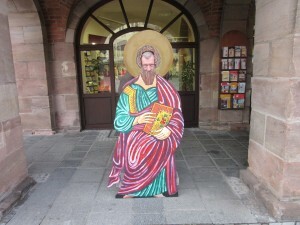 Lots of bookstores and Dan being Dan! A Meissen Porcelain store where this horse will set you back, ( I kid you not) $17,500.00. We went through the store afraid to breathe! 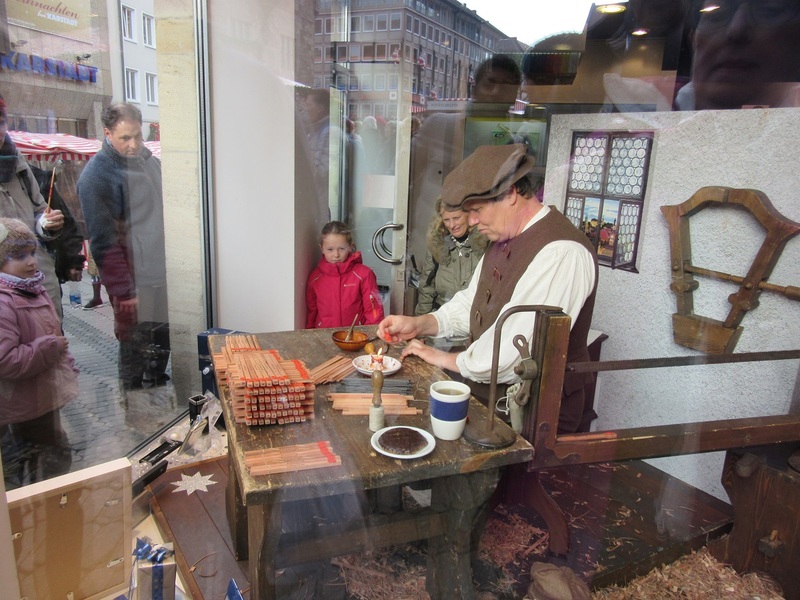 There was a woman in there hand painting a Porcelain plate. It was stunning! 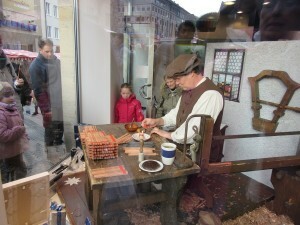 Or this store selling artist supplies and this man making finely crafted Pencils! 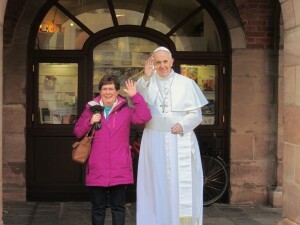 I even met the Holy Father! Well, not really but I’d like to some day. 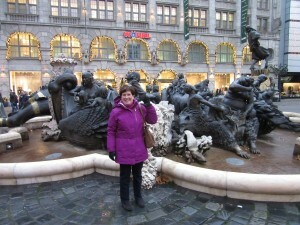 Elaborate and ornate fountains and statues. You never knew what was around the next corner! 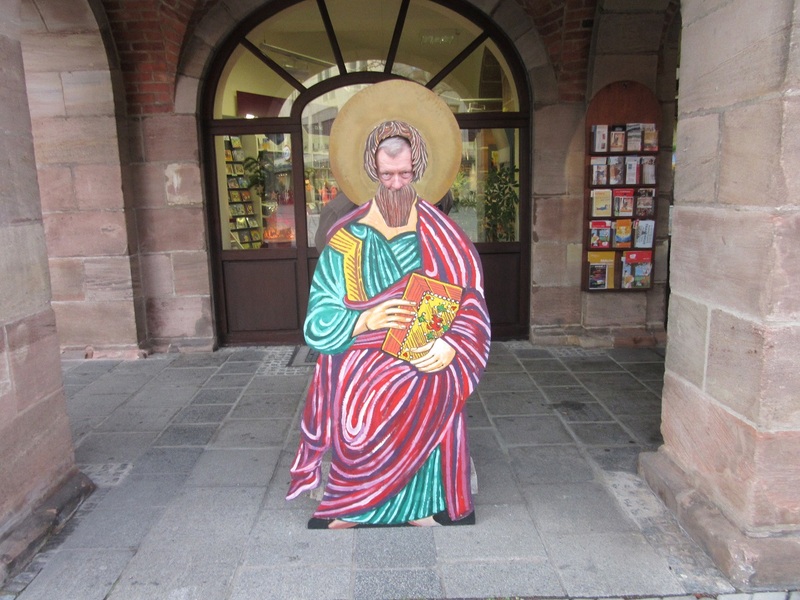 I could go on and on about Nurnberg. Actually, I think I just did, but it was such a wonderful experience I just had to share as much as I could with my friends! As usual, I truly wish you all were here with me. We’d have so much fun and Sparky really would bail us out ! ( I think). Thanks so much for stopping by today. Remember, “a journey of a thousand miles begins with a single step.” Never fear taking that first step. Journey on! 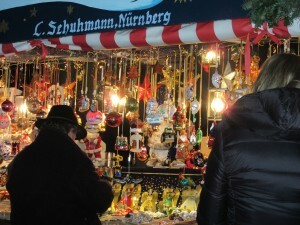 « Christkindlmarkt Munchen or Munich’s Christmas Market!